Kevin Schafer is an award-winning wildlife photographer whose work has appeared in all of the world's most respected nature and science magazines, including National Geographic, Smithsonian, Natural History, GEO, National Wildlife, BBC Wildlife and Outside. 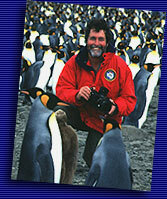 Kevin worked as a seabird biologist and naturalist for many years before becoming a full-time wildlife photographer. Since 1981, he has traveled to some of the most remote places on Earth to photograph all seventeen species of living penguins - the first professional photographer to achieve this. When not on the road, he lives in Seattle, Washington with his wife, artist and author Martha Hill. "My life has been shaped by penguins. They have inhabited my dreams and fueled my longings for distant shores and cold, windswept islands. As a young man, penguins stirred in me a passion for the natural world and nudged me towards a career as a wildlife photographer. They have taught me volumes about the twin miracles of life and evolution, and inspired me with their simple, determined struggle to survive, often under the most difficult conditions imaginable. For all these things - and simply for the fact that penguins exist - I am grateful. Everyone seems to love penguins and clearly I am no exception. Yet my fondness for penguins is hardly that of a starry-eyed romantic: I have wallowed in far too much guano for that. Yet there remains, even in a hardened naturalist soul like my own, an inescapable delight in their company. For although I have seen penguins at their worst - in the filthy, squabbling chaos of their breeding colonies - I have also seen them at their most sublime, gliding with infinite grace through the endless blue water of the southern ocean." For more information, visit the Kevin Schafer Photography website.